HyperStudio recently launched a new Fellows Program! The HSF gathers a range of postdocs and visiting scholars in the humanities, librarians, technologists, artists, curators, and other members of the MIT community to generate questions and energy around the Digital Humanities. This spring, our Fellows meet bi-weekly and attend DH-related events to brainstorm possibilities for potential programming, incubate projects, and discuss our varied but shared scholarly, pedagogical, and publishing practices in the digital age. The HSF program aims to cultivate community and collaboration at the edges of disciplines and fields, finding overlaps, and investigating productive tensions that suggest opportunities for new creative and critical engagements through digital realms. 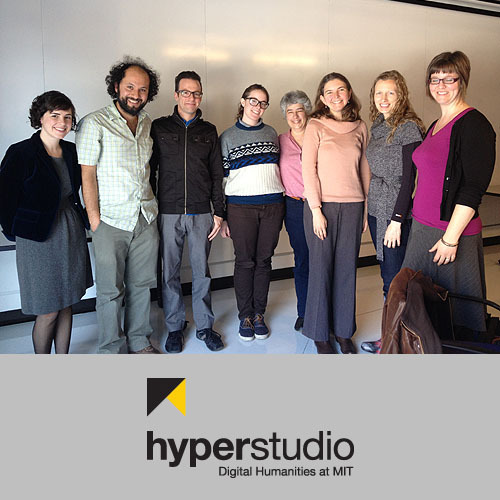 By bringing together staff and non-permanent faculty at MIT, the HyperStudio Fellows program hopes to grow a hub of DH activity not only within HyperStudio and between existing MIT departments, but also as our Fellows interconnect with the Boston DH consortium, and beyond. If you are interested in participating, or have suggestions of good candidates, please keep watch for an application for the HyperStudio Fellows program for the 2013-14 academic year (to be posted later this spring). We welcome suggestions about our evolving mission, as we seek ways to address existing needs at MIT, to reach out and tap members of the community with relevant experiences and interests, and to encourage cross-disciplinary collaborations. Questions? Ideas? Interest? Please contact Gretchen Henderson at hendersong [at] mit [dot] edu.